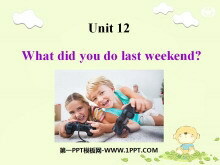 《What did you do last weekend?》PPT课件4 1a Match the activities with the pictures [a-f]. 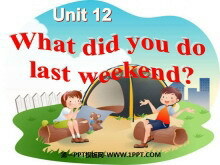 1. did my homework __ 2. went to the cinema __ 3. went boating __ 4. camped by the lake __ 5. went to the beach __ 6. p..
《What did you do last weekend?》PPT课件3 用所给动词的适当形式填空。 1.We ______ (live) in Japan last year. 2.Jack________ (stop) the car last Sunday. 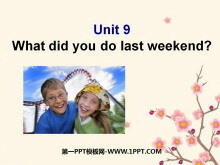 3.Tom _______ (clean) my room and ______ (study) for the Ch..
《What did you do last weekend?》PPT课件2 3a Look at the pictures and complete the passage. I had a busy weekend. On Saturday morning I ________. In the afternoon I _________. It was a little difficult. 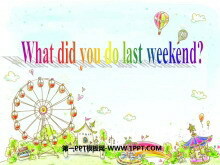 On Satu..
《What did you do last weekend?》PPT课件 3a Fill in the blanks with who what when where or how. 1. A: ________ did you do last weekend? B: I played badminton on Saturday. A: Sounds fun! 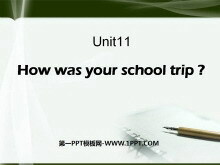 _______ did you play wit..
《How was your school trip?》PPT课件7 Remember these phrases do his homework take some photos play football. pick strawberries ride a horse. talk with a farmer watch TV. 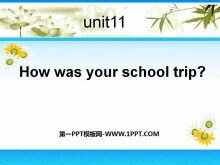 feed chickens milk a cow go for a walk A..
《How was your school trip?》PPT课件6 Match the phrases with the pictures. 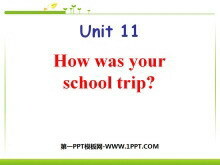 1. went for a walk ____ 2. milked a cow ____ 3. rode a horse ____ 4. fed chickens ____ 5. talked with a farmer ____ 6. took some photos..
《How was your school trip?》PPT课件5 Warming-up Make up a story. Each student adds a sentence. If he or she cant add a sentence he or she must sing an English song. Last week I went to the zoo. 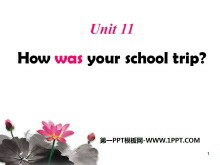 I __________ in..
《How was your school trip?》PPT课件4 短语归纳 1. go for a walk 去散步 2. milk a cow 挤牛奶 3. ride a horse 骑马 4. feed chickens 喂小鸡 5. talk with 与谈话 6. take photos 拍照 7. quite a lot 相当多 8. show aro..
《How was your school trip?》PPT课件3 Look at the picture. This is a farm. Last week Carol and his classmates had a school trip. They went to the farm. What did they do on the farm? How was their school trip? 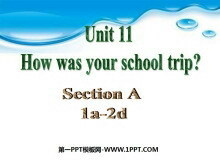 D..
《How was your school trip?》PPT课件2 Dear Bill How _____( is ) your school trip yesterday ? _____(Do) you ____(go) to the zoo ? ____you ____( take ) any photos ? ____(Do)____ ( see) any interesting animals ? 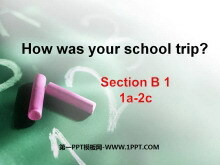 ..
《How was your school trip?》PPT课件 Grammars : 一般过去时： 1.定义：表示过去某个时间或某一段时间内发生的的动作或存在的状态，常和表示过去的时间状语连用，如yesterdaylast night in1990two days ago 等。一般过去式也..